Geekerella follows Elle, a die-hard fan of the cult-classic Starfield series. She is determined to win the cosplay contest at ExcelsiCon, and get to meet the actor who is playing the lead in the new reboot, a casting decision Elle is not happy with. Meanwhile, Darien has been cast in his dream role, but fans aren’t happy with him and don’t believe he actually cares about the show. This book is adorable, funny, and a perfect representation of what it is to be a geek. This book, while being a Cinderella story, didn’t feel like one. All of the Cinderella tropes and twists felt natural and organic. The strory progressed naturally and the fairytale aspects blended in perfectly. The plot remained interesting, especially due to all the fandom aspects included in the book. You can really tell that this is a love letter to convention culture. After finishing the book, I just wanted to fast forward to when I would be going to NY Comic Con. The pacing was perfect, making this a perfect quick read. Ashley Poston’s voice is another great aspect, really pulling you into the story. Her characters felt real and understandable. I could see Elle in so many fellow fans I’ve met at the various conventions I’ve gone to. Darien was also great, and brought an interesting perspective to the story. Cons– The stepsister parts of the book kinda annoyed me, but I always hated that part of Cinderella. 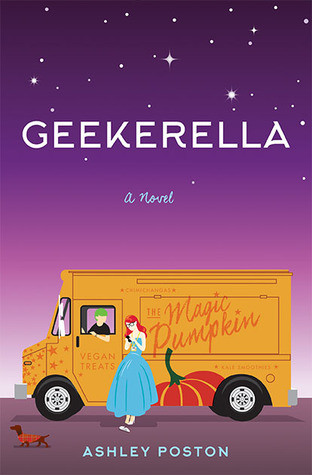 Geekerella is the perfect feel-good read for any nerd who dreams of going to the con.